Download the free guide and keep up to date on boating safety. You must be certified to operate a motor boat over 25 HP. More info. Navigation lights must be on and in working order both BOW AND STERN between sunset and sunrise! All persons being towed behind a boat must wear a personal flotation devices. When towing, an OBSERVER MUST BE ONBOARD and be at least 13 years old! No more than two persons may be towed at a time. If two persons are being towed there must be two observers. Persons may be towed only during daylight hours (sunrise to sunset). A person under 16 years of age may not legally operate a vessel powered by more than 25 horsepower unless he or she is accompanied by a person 18 years of age or older who has a valid Safe Boater Education Certificate. The accompanying person is responsible for any injury or damage caused during operation of the vessel. No one under the age of 16 years may legally operate a “ski craft” (a vessel less than 13 feet in length that is capable of exceeding 20 miles per hour and has capacity to carry no more than two persons. Examples are one and two-person jet skis). ​Subject to the restrictions above, persons as shown on the table below may operate a vessel powered by more than 25 horsepower only if he or she has obtained a Safe Boater Education Certificate. 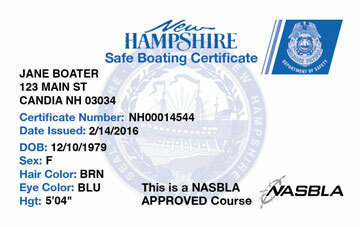 The certificate must be obtained by successfully completing a boating safety course or equivalency exam approved by the New Hampshire Marine Patrol or a National Association of State Boating Law Administrators (NASBLA) approved course of another state. The certificate must be carried on board.